A few NELSAP readers remember this area that operated in Hooksett. Ron Sandmann says that the area was also known as Raiches Ravine and was located at the junction of Rte 28 and Bypass 28 in Hooksett. He also says the area was on Campbell Hill and had an old Howard Johnson's restaurant in front of it. I remembered another ski area, a slope north of Manchester NH on Rt. 3, Daniel Webster Highway, probably just around the Hooksett line called Reichville --sold mobile homes on main road. The area was in back of the mobile homes. Since this area (called Reichville and Raiches Ravine) are almost are the same, they are likely the same area, though I'm not sure on this. If anybody else remembers this area, let me know. 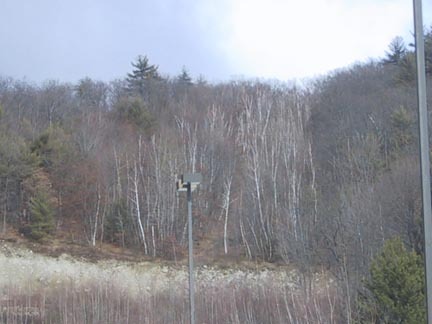 Here's a Terraserver pic (found by Betsy McDonough) of the area, clearly showing a long slope. This is just at the junction of rte 28 and 28 bypass. Looks like part of the lower slope has been removed. A view of the slope today, from Betsy McDonough. Notice how part of it has been removed.